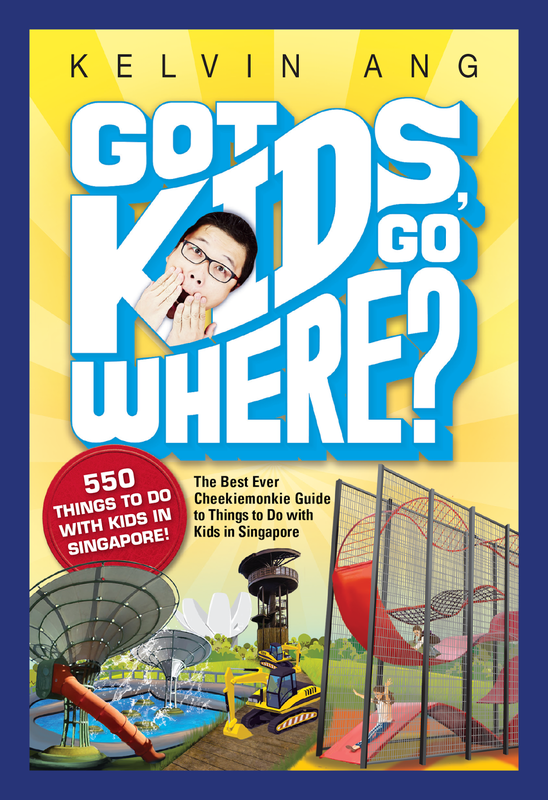 When planning a holiday with the family, I am sure all parents want to ensure the travel destination is not only kid-friendly but there are ample activities to keep the kids happily occupied as well. And as you probably already know after having read my previous post on Fiji, it is a beautiful country filled with friendly people who simply cherish kids. And while most resorts have fantastic kids clubs on site - which offer supervised games and activities - Fiji is so much more than that. So to create terrific Fiji memories, we took the monkies on a family adventure and experienced some of the most fun, kid-friendly activities! No giants here, only plants. But lots and lots of it. Sitting at the foothills of the Nausori Highlands - its mountain range skyline resembles that of a sleeping giant's silhouette - the attractive landscaped gardens is about 10 minutes drive north of Nadi. Home to Fiji’s native plants as well as an impressive collection of more than 2000 varieties of magnificent Asian orchids and Cattleya hybrids orchids, the Garden of the Sleeping Giant was once the private collection of the late American actor Raymond Burr. Now open to the public for a fee of F$18 for adults and F$9 for kids (6-15), we were able to wander through the lush and fertile plantation which took us past a large lily pond and through native forest. The great thing about the Garden is guides are available on site to walk visitors through the ground, at no additional cost. We were given a brief description of the property and a little history of how the mountain valley was transformed into the fantasy garden it is today. After that, it was pretty much being awed in the presence of such stunning scenery. Of course, there were a few play structures to keep the monkies occupied as well. Overall, the Garden of the Sleeping Giant makes a nice relaxing break from the beaches and pools. If you are visiting the Garden of the Sleeping Giant, never ever - never, I repeat - miss out on paying the Mud Pools a visit as well. Located just past the Garden, the Mud Pools allows for a very family-bonding sort of experience. Forget the spa resorts. The facilities here may be very basic but covering ourselves with MUD is the ultimate therapeutic natural spa! In all honesty, the monkies intially found it to be disgusting but after we slapped on a layer of mud, they were all giggly and game for more. After allowing the mud to dry in the sun, we hopped into the mud pool to wash it off. We then ended the experience by soaking in a hot spring. Very rejuvenating! It is claimed that the mud and hot spring have have age-defying and healing benefits but all I know is Sabeto Mud Pools and Hot Springs is a must-do when visiting Fiji because playing with mud has never been this fun! For the greatest fun under the sun, you simply must spend a day at tiny, unihabited South Sea Island. As we found out, this gorgeous wee slice of paradise offers a fantastic array of activities for everyone in the family! A day trip to South Sea Island is an easy 30 minute ferry ride from Denarau Marina with South Sea Cruises. The close location to Denarau means that we could make the most of the day lazing on the beach, snorkelling, diving and enjoying the myriad of activities on offer. They say awesome things come in small packages, and what a gem South Sea Island turned out to be. Peppered with palm trees and surrounded by a coral lagoon, the island is tiny - only a 2-minute walk from end to end so no chance of kiddos getting lost! No one lives permanently on the island; the only guests are the travellers who spend the night in a dorm atop the open-air restaurant, built with a rustic island theme in mind. But small as it may be, the island packs a chock-ful load of activities. In fact, the toughest part for the monkies was deciding what to do first! There is a salt water swimming pool... which the monkies wasted no time in diving in. There are also non-motorised water sports equipment available free of charge, including kayaking and sailing. The monkies then made a few fishy friends, thanks to the hours of snorkelling. Prefer to stay dry? There is always the option of jumping onboard the semi-submersible coral viewer. It was like going on a submarine tour, and the monkies enjoyed it tremendously! 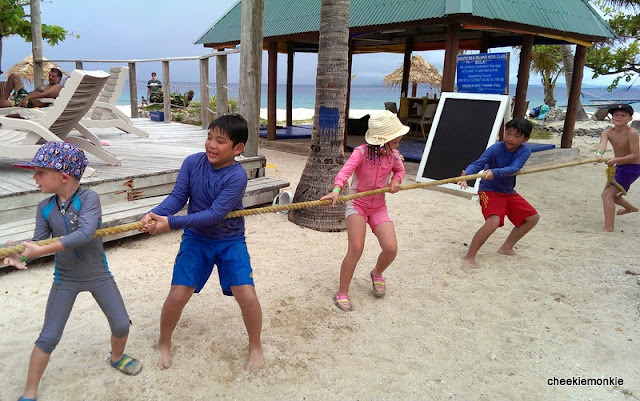 Exclusively for kids, there is also a Kids Club on the island where they can play with sand toys, dabble in some artwork, have their faces painted.... or if the need to flex some muscles is warranted, there is always the tug-of-war friendly competition. Oh, and did I mention that all food and drinks are inclusive? Free flow beer with such a stunning beach view. I can live here forever. As expected, lunchtime is a highlight on the island where everyone gathers around rustic tables at the open-air restaurant to enjoy a delicious buffet lunch with salads, rice and BBQ meat. Fijian performances are always welcome too. We were on the island from 9.30am to 5.30pm and even then, it wasn't enough for the monkies. Crystal clear waters, coral reefs and thousands of colourful tropical fish. What's not to love about South Sea Isalnd? 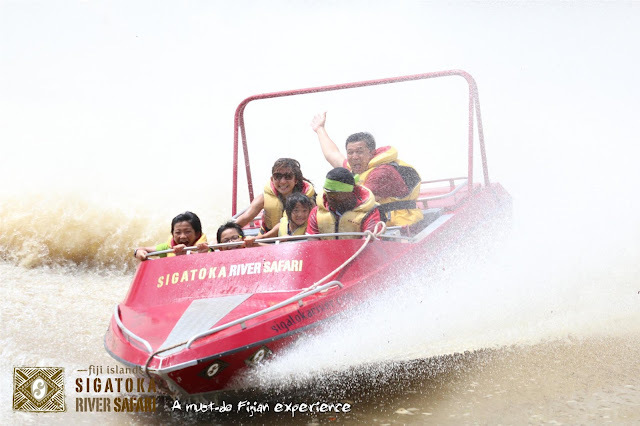 There is the therapeutic Sabeto Mud Pools, there is the relaxing South Sea Island, and then there is the ultimate adrenaline-pumping Sigatoka River Safari! 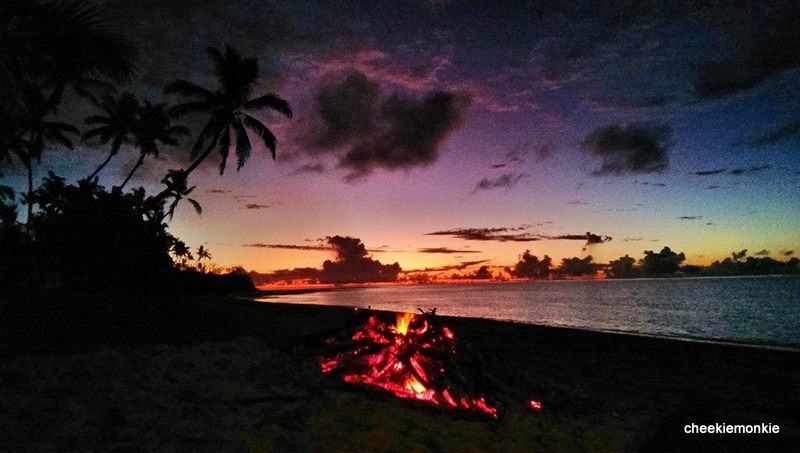 There may be companies which label their Fijian cultural experiences as 'authentic' but most of the time, visitors do not get a true feel for the local lives of villagers. The Sigatoka River Safari, on the other hand, is famous as a top-notch cultural tourism activity that is perfect for all ages. For starters, kids will love the 30-minute jet-boat ride! I know the monkies did. Especially since it is mandatory for the jet boat to spin 360 degrees at high speeds at certain points during the journey. You know, just for the fun of it. That explains our thrilled (or maybe shocked) faces. And did the monkies request it for more than once? You betcha! But the Sigtoka River Safari wasn't all about thrills and spills. There was some breathtaking natural landscape to behold. Along with the occasional goats and horses grazing along the banks of the river. In fact, numerous Fijian villages still live by the 120km-long river and they freely waved to us as they went about their daily lives in the river. Absolutely amazing! At the end of our boat ride, we arrived at our designated village. Sigatoka River Safari is the only tour in Fiji which visits a different village each day of the week, to allow all visitors enjoy life in an authentic Fijian koro (village). More importantly, the tour provides an additional source of income for the villages in the Sigatoka Valley area as the tour rotates among the 14 villages there and a portion of the fees are given back to them. After meeting the village chief, we were given a brief tour of the surroundings. before being ushered into the communal hall where a welcome ceremony awaited. And this was where all of us, including the boys, had our first taste of Kava, Fiji's national drink. Once the formalities were over, the villagers sang for us and it was time to mingle! Oh, and not forgetting feasting on an amazing Fijian food spread too. We ended our visit by dancing with the villagers and the thing that struck me was how incredibly warm and friendly the local villagers were. And yes, the monkies made new friends too! 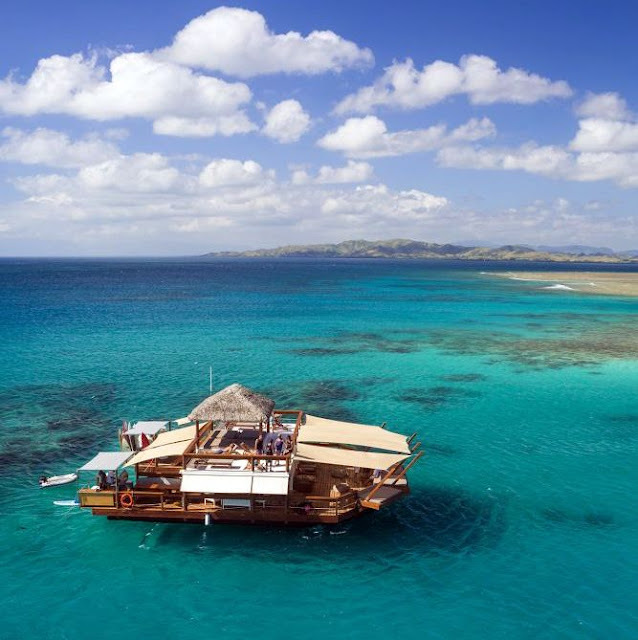 I have to rank Sigatoka River Cruise as one of the top highlights of our time in Fiji. It is a fantastic culturally enriching experience for the kids, where we got a glimpse into how village life in Fiji is really like. Robinson Crusoe Island is just a 40-minute drive from Nadi, followed by a 30-minute river cruise to the island. Never mind what activities awaited us on the island. For me, the sunset view alone was more than enough to get me intoxicated. But then, my tummy rumbled and reminded me the reason why I was on the island for. This. Rocks are first heated which will serve as the base for the lovo. Meat are then tightly wrapped in a weave of palm fronds or banana leaves before being placed in the bottom of the lovo pit lined with hot rocks. Various root crops like cassava and wild yam are added to the top. The entire hole is then filled with earth and left to simmer and cook for two to three hours. And while the food was being dug out of the pit, the performers upped the entertainment factor by putting up a Fire Walking show too... which was followed by a sunset bonfire. As we tucked into our Island Roast Feast of Roast Pork, Roast Beef, vegetables & other local Fijian dishes, the REAL show began. Billed as Fiji's best South Pacific Island and Polynesian cultural show, it features some of Fiji's top fire and knife dancers - all woven together in a spectacular and sometimes, heart-stopping performance. And when the Fijians do a fire show, they do it REALLY big. Situated in the heart of the beautiful Denarau Island, Big Bula Inflatable Waterpark is the world's largest permanent inflatable waterpark. 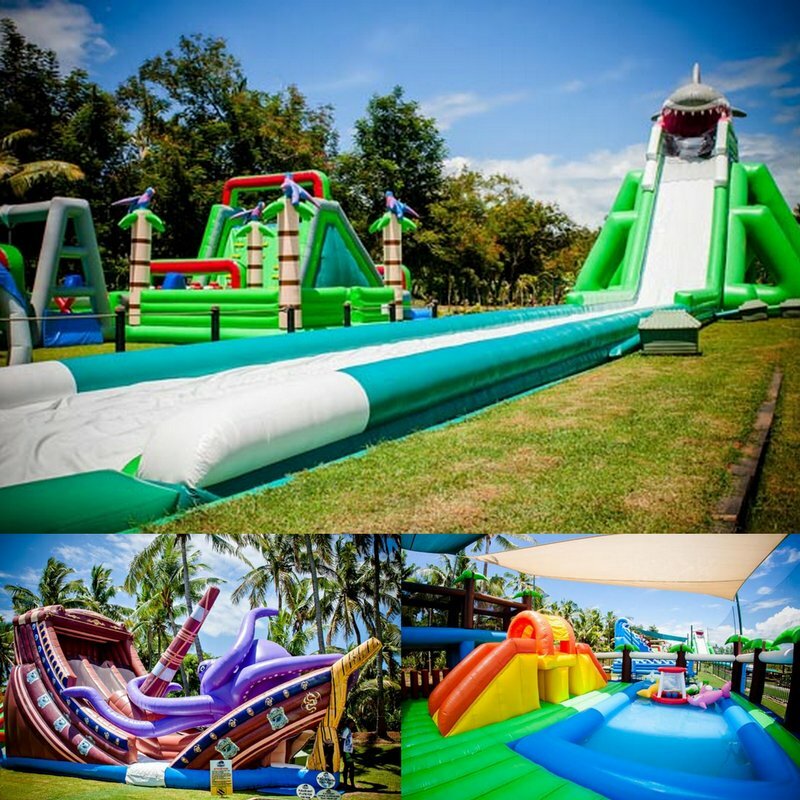 From giant water slides to surfing big waves, climbing 10 metre high palm trees and racing through obstacle courses, kids can slide, jump and bounce to their hearts' content! There is also a dedicated area for the younger ones in a gated area. Kula Eco Park is an excellent Fiji family attraction for babies, toddlers and children. Here kids will be able to walk through the animal enclosures to see birds, exotic plants, reptiles and fish right inside an enclosed forest. With almost a kilometer of wooden walkways, bridges and rest areas, the park provides visitors with the opportunity to experience the 'wild side' of Fiji in comfortable and safe surroundings. Little ones can even get up close with the local animals and hold a snake or iguana. In addition, Kula Eco Park runs several breeding programs committed to preserving and building up indigenous animal species. The South’s Pacific’s first and only zip-line adventure, Zip Fiji is located in the heart of a tropical rainforest on a private eco-reserve. An adrenaline-pumping activity that can be tried by children as young as 5, everyone will love flying across the 8 zip lines (up to 500 feet long!) over the rainforest canopy. But not only only is the jungle surfing adrenaline-inducing, it will be highly educational too as the session is tuned for ecological and cultural appreciation. I guess only one word is needed - STUNNING. Cloud 9 is a floating paradise located literally in the middle of the ocean surrounded by nothing but turquoise blue water, coral reef and the horizon! Fiji's only two level floating platform comes with a bar and Italian wood-fired pizzeria - perfect companions for a day of snorkelling or doing absolutely nothing. Looks like we have to pay Fiji another visit!